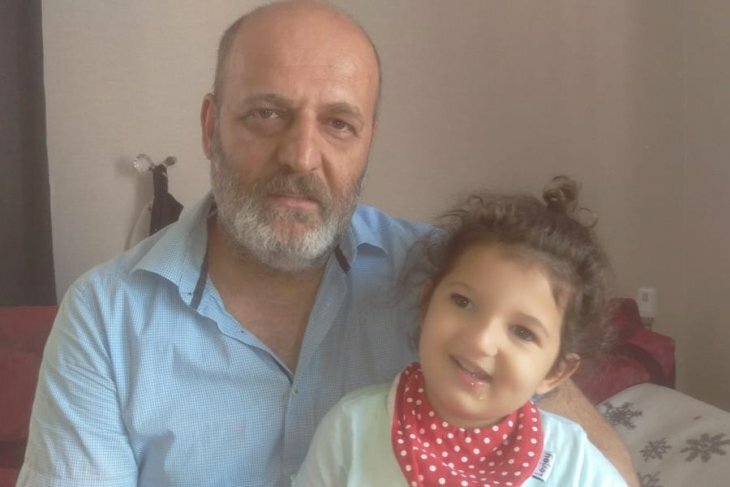 A 4-year-old girl from Turkey’s Mersin province who has been suffering from microcephaly, a rare medical condition in which the newborn’s skull is much smaller than expected, is unable to leave Turkey as her parents face travel ban due to post-coup emergency rule. In addition microcephaly, Arin Rohani has also difficulty in speaking and walking, all of which give her a 92-percent disability. One and a half years ago, she received an initial treatment at a private hospital in Germany. “She stayed at the hospital for 25 days. She was only 1.5 years old. Following the treatment, we were asked to bring her to the hospital once she turns 3. She was supposed to go through related tests and surgery accordingly. Then, my wife and I were dismissed from our jobs. We were barred from going abroad,” Arin’s father Murat Karahan told media. Murat and his wife were working at Akdeniz Municipality before they were purged as part of the government’s post-coup crackdown. The administration of the Akdeniz Municipality had been earlier earlier seized over the mayor’s alleged ties to the outlawed Kurdistan Workers’ Party (PKK) like dozens of other local administrations. Both Murat and his wife were briefly detained after their dismissals. “My travel ban was lifted a month ago. My wife’s ban was revoked as well. However, we are still being denied departure from Turkey since we were dismissed with an emergency decree,” Murat said. Karahan couple’s plight is not limited only to a ban on their overseas trip. Now that they were unemployed, the father filed an application for the patient-care-support for their disabled child. “Even if a citizen is jailed, his\her spouse or child is entitled to get this support. …But we were told that we would not be provided this service since we were dismissed with an emergency decree,” Murat concluded. In Feb 2017, a 12-year-old child died of brain cancer several months after Turkish border agents seized his and his parents’ passports at İstanbul Atatürk Airport over links to the Gulen movement, causing the family to abandon their plans to receive cancer treatment in Cuba. More than 150,000 people have lost their jobs since the July 15, 2016 failed coup, for which the government blames the Gulen movement. The movement denies involvement. A following crackdown by the government targeted mostly the followers of the movement and Kurdish minority.